Third revised edition, loaded March 13, 2018. S'rî S'uka said: 'When Bharata ['to be maintained'], who was a most exalted devotee, according to the order of his father decided to rule the earth, he, assuming that supreme command, married the daughter of Vis'varûpa, Pañcajanî. The way identifying oneself with matter [false ego] leads to the five sense objects [of sound, taste etc. ], Bharata likewise arrived at the five sons he begot in her and who were just like him: Sumati, Râshthrabhrita, Sudars'ana, Âvarana and Dhûmraketu. From the beginning of the rule of Bharata this part of the world, that was called Ajanâbha [referring to king Nâbhi, see 5: 3], is celebrated as Bhârata-varsha [the land of Bharata, now India]. He, who was a great scholar, was a ruler as great as his father and grandfather. Governing with a caring heart, he kept both himself and his citizens engaged in the classical vocational duties. Next to that he worshiped the Supreme Lord with great and small sacrifices, with and without animals. Full of faith agni-hotra, dars'a, pûrnamâsa, câturmâsya, pas'u and soma-rasa yajñas were performed, in part or fully, that, as was prescribed, practically always were conducted by four priests (*). When the expert priests with all supplementary rites were engaged in performing the various sacrifices, he, who was constantly thinking of Vâsudeva, the Supreme Lord, and who in the spirit of the hymns was freed from lust and anger, recognized that all the different demigods, the recipients of the results, the ingredients of the offering and he himself, the sacrificer, were all part of the body of the One Original Person. He [Vâsudeva] was the one enjoyer who, irrespective the results of the sacrificial ceremony in question that was performed for the purpose of dharma, was their controller, their doer and their origin; He was the one responsible for the complete of all the gods. He [Bharata] in the perfection of his service was thus of the purest goodness unto the Supersoul within the heart of the ethereal body, unto the impersonal spirit of Brahman and unto Bhagavân, the Supreme Lord, Vâsudeva, the Supreme Personality whose form is recognized by the S'rîvatsa mark on the chest, the Kaustubha gem, the flower garland, the disc, the conch shell, the club and other symbols. Once He as an indelible image has appeared in the heart of the devotee, He, who on the highest level is known by His radiating personal form, has the power to increase one's devotion day after day. Thus for a countless number of millennia [by this exemplary practice] having ascertained the wealth he had received from his forefathers, he, at the right moment for abandoning his earthly duties, properly divided his kingdom personally among his sons and then left that ancestral abode behind to go to the meditation resort of Pulaha in Hardwar. It is at that place where even today the Supreme Lord Hari, being moved by His paternal affection, shows Himself to the devotees residing there in the form they prefer. That meditation resort is on all sides sanctified by the water of the main river, the Cakra-nadî [the Gandakî]. In that river one finds the [round] stones with the concentric circles on top and below [the black oval pebbles that serve as objects of worship, the so-called S'âlagrâma-s'ilâs]. There, alone in the fields of Pulaha's meditation resort, he, with offerings of roots, bulbs and fruits combined with water, twigs, tulasî leaves and all kinds of flowers, worshiped the Supreme Lord and was thus, being delivered from all material desires, purified in a steady increase of transcendental tranquility that brought him satisfaction. By that constant practice of serving the Original Personality of the Supreme Lord, the laxity of his heart disappeared with the weight of the incessantly increasing attachment to Him. By the force of his transcendental bliss the hairs on his body stood on end with tears blurring his vision that sprang into his eyes because of his intense longing. Thus meditating on the pink lotus feet of the Lord, there was from his bhakti-yoga an increase, spreading everywhere, of the highest and deepest spiritual ecstasy in his heart, in which he was immersed as in a lake, and because of which he, despite his intelligence, no longer was capable to keep the performance of the worship of the Lord in mind. *: Such sacrifices are now impossible to conduct in this age due to the scarcity of expert brahmins or ritvijah who are able to take the responsibility. In the absence of these, the sankîrtana-yajña singing of the holy names is recommended. may this light illumine our intellect. 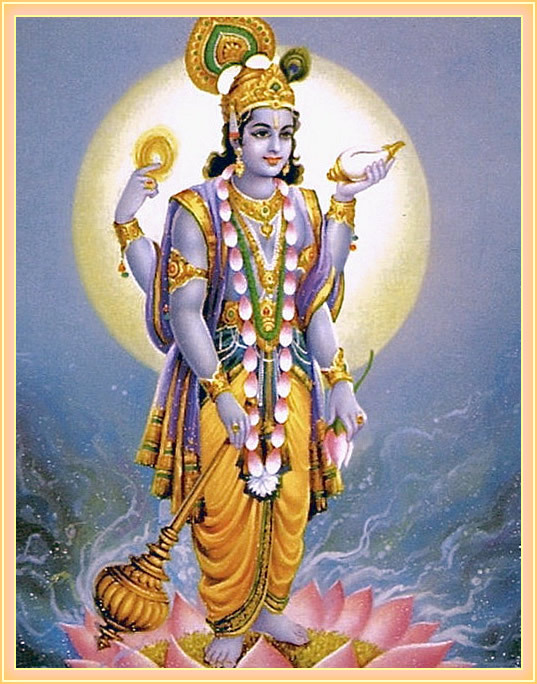 The modern Hindu image shows Lord Hari standing on the lotus of the heart.